The evocative ruin of the late 13th-century castle of Castell Dinas Brân has been the subject of posts before on Archaeodeath here and here. The site is key to my ongoing collaborative work with Patricia Murrieta-Flores regarding the landscape context of the Pillar of Eliseg, and my work on Project Eliseg. Hence, the hill is worthy of another post. 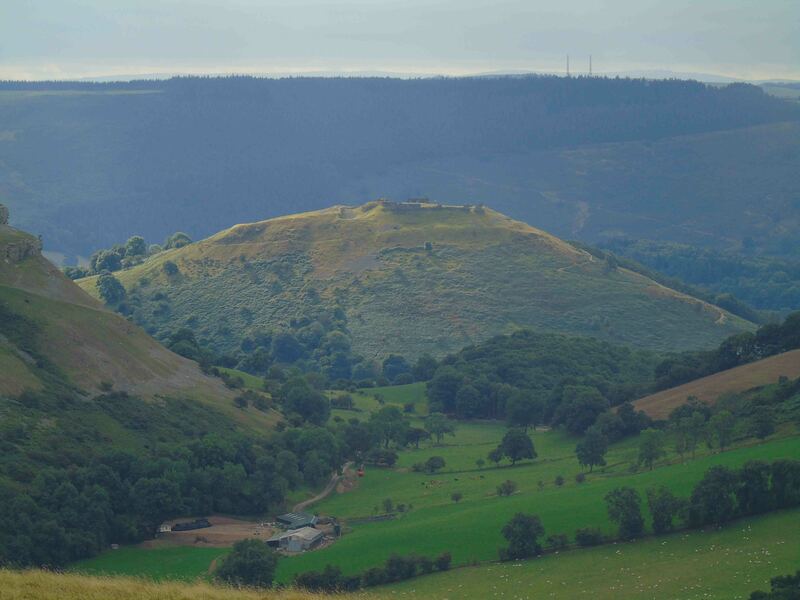 The hillfort and later castle is positioned to dominate the Vale of Llangollen’s easterly end and exit into the Cheshire plain, as well as the ford at Llangollen itself and westwards along the Vale towards Corwen. It is unproven but possible that the hilltop was occupied/utilised intermittently throughout the first millennium and early second millennium AD before it enters the historical record before its destruction and abandonment during Edward I’s conquest of Wales. From the castle, the dramatic limestone outcrops of Creigiau Eglwyseg and Trevor Rocks block views to the north and north-east. This is not, however, in any regard a ‘blindspot’ for the castle’s which dominates the landscape in this direction too, including parts of the Eglwyseg valley to the north-west. Previously, however, I have not seen the castle specifically from the north-north-west: from high up in the Eglwyseg valley, although I have previous viewed it from Fron Fawr to the east of the Pillar of Eliseg. Here is a view I recently took from higher up the side-valley to the north: close to the Clwydian Way to the east of Pentre-dwfr. I hope you like it. From this perspective, the castle is viewed from the north with the Vale of Llangollen behind it. The valley you are looking down likes between the Trevor Rocks and Fron Fawr, i.e. the valley heading north from the Vale of Llangollen parallel to the Nant Eglwyseg along which Valle Crucis and the Pillar of Eliseg are situated. More than like it, I think it is key to an important argument I would make about the significance of the hilltop in the first millennium AD and the approaches to the Pillar of Eliseg that Paty and I will be outlining in a research paper forthcoming in the journal Medieval Archaeology. Namely, we suggest that the site of the later castle might be part of a visual control network guarding approaches to the area of the Pillar of Eliseg and the later monastic house of Valle Crucis. In the forthcoming paper, we hope to demonstrate this in greater detail.